Performance in this group requires a high level of commitment because the repertoire demands outside practice in addition to the regular rehearsals and some of the responsibilities ( dress rehearsals and concerts ) can be outside of the regular rehearsal schedule. Orchestral literature requires high level solo wind players since they are usually one person on a part and this also means that there are limited wind slots. These slots will be given to only the highest level performers. Accordingly, in order to give as many high level wind players the opportunity to perform in this ensemble, players will rotate between Symphonic Winds MUEN 383 ( which rehearses at the same time ) and Orchestra. This will require these performers to register for both courses ( MUEN 385 and MUEN 383) for either 0.0, 0.5, or 1.0 credits. There is a special second section of Orchestra for wind and percussion players to enroll in so that there is no “class conflict” in SIS. This will all be explained in the audition. Similarly, the string section is also very competitive and in order to maintain the highest quality performance of this kind of orchestral literature, the string section must not get to large and remain balances so as to maintain section clarity. As a result, we have strict enrollment quotas per section so most first-year students will be assigned to the Case Camerata Chamber Orchestra (MUEN 386 ) until slots are available. Request course (MUEN-385) permission in the CWRU Student Information System (SIS). Course permission will be granted after an audition has been completed during the first week of school. Permission requests will remain pending until the end of audition week. Once you are “granted permission” you need to go back into SIS and complete your registration. In order to perform in the ensemble you must officially register. Specialty and large instruments are available on a limited basis for use by those enrolled in our ensembles. Lockers are available for music majors, minors, and those non-majors who participate in a Department ensemble. Please click on the link below to submit a locker request. Please note, due to the busy start of term, it may take us a bit to respond to all requests and we ask for your patience. 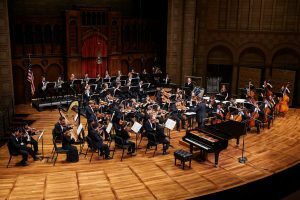 When does the Case University Circle Symphony Orchestra perform? All Auditions for the Case University Circle Orchestra ( MUEN 385, Monday and Wednesday 7:00 – 8:30 pm ) and Case Camerata Chamber Orchestra ( MUEN 386, Tuesday and Thursday 7:00 – 8:30 pm ) will be held in the Denison/Wade Rehearsal Facility beginning on Monday August 27 and continue through Thursday August 30, 2018. Auditions begin each afternoon around 4:00 pm and go through the evening. Orchestra Excerpts (For String Players ONLY available on July 3, 2018 via this page.